Is it any wonder that investors are getting jittery? The stock market had priced in much of the anticipated benefits to business, wages and profits, which accounts in no small part for the $3 trillion rise in equity values and the surge in business and consumer confidence after the election. Now the confidence is waning. Without a tax cut passage in 2017, the odds of Republicans losing the House and Senate in November 2018 are heightened. The economy needs time to respond to the growth hormones from the Trump tax plan. A prosperous economy in 2018 is by far the best way for the GOP to build on its historic victory in 2016. We reject the idea that a simple, clear, growth-oriented tax cut can't happen this summer. Barack Obama passed an $830 billion so-called "stimulus bill" within weeks of his new presidency in 2009. 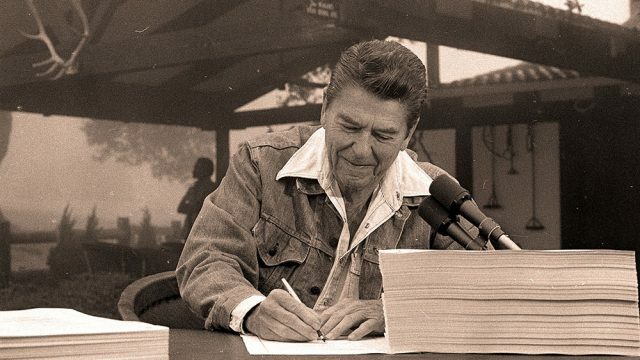 Ronald Reagan signed into law at his ranch in Santa Barbara, Calif. his historic tax cut — then the largest in history — by August of his first year in office. The only reason Republicans haven't made this happen is that the tax cut has not been a priority. 1. A 15% business tax rate for small and large businesses, with full and immediate expensing for capital purchases. 2. A repatriation tax at 10% for foreign earnings brought back to the United States. 3. A doubling of the standard deduction from $6,500 to $13,000 for individuals and $13,000 to $25,000 for couples,‎ to put more money into their pockets now and to simplify tax returns.